I was quite curious about this film, since this was my first contact with Bangladeshi cinema. At the end, Abdullah Mohammad Saad's feature film debut made me to want to search more the country's cinema. Sazzad is a truly desperate man, whose handicapped leg seems to be the least of his worries. The stock market has crashed, and his stocks' value has plummeted. He is paying for a loan, and he barely manages to make payments. He is pathologically jealous of his girlfriend, Rehanna, to the point that he is suspicious of every phone call she receives. His brother, Michael, who is staying with him, is a drug addict, who occasionally has fits of rage when he cannot find his dose, trying to persuade Sazzad to give him money. Tired of his situation in Dhaka, he applies for a travel visa, in order to leave for Russia. His troubles do not end, as his girlfriend informs him that she is pregnant and needs money for an abortion. This, however, is not the end of his problems. Most of the film occurs in two settings: Sazzad's car, with the scenes featuring a number of elaborate tracking shots, and in his house. There are scenes in other places, like the agency where Sazzad goes to apply for a visa, but the two aforementioned are the main ones. 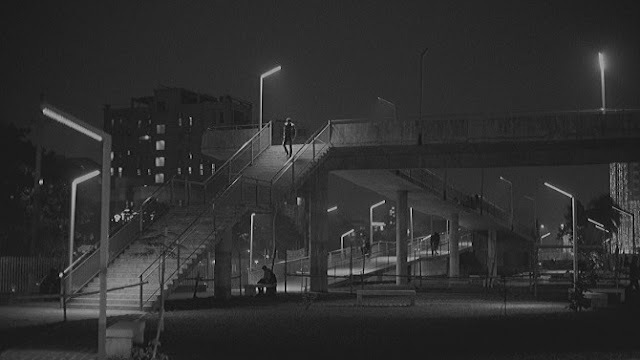 Particularly through the scenes in the car, Saad portrays the urban setting of Dhaka, with Tuhin Tamijul's black and white cinematography highlighting its beauties. On the other hand, the scenes in his house are sad and claustrophobic, since something bad constantly happens when he returns there, with no chance of redemption. Saad uses a very interesting editing technique, since the setting changes almost constantly, with each scene being quite brief, much like vignettes. In that fashion, he keeps the pace at a relatively fast speed, which seems to suit the story perfectly. The film obviously revolves around Sazzad, and Mostafa Monwar is great in his role, giving a wonderful performance. His biggest trait is that he manages to portray, realistically, a plethora of feelings and psychological statuses, which randomly succeed each other and include jealousy, anger, fear, angst, concern, despair and exhaustion. Tasnova Tammana is quite good in the role of Rehanna, a woman is gradually becoming fed up with Sazzad's behaviour. Tanvir Ahmed Chowdhury is also quite persuasive as the drug addict, with his fits of rage being the highlights of his performance. "Live from Dhaka" is an accomplished debut, and a very meaningful film altogether, which particularly highlights Abdullah Mohammad Saad's direction and Mostafa Monwar's acting. The awards they both received from the Singapore International Film Festival were well justified.